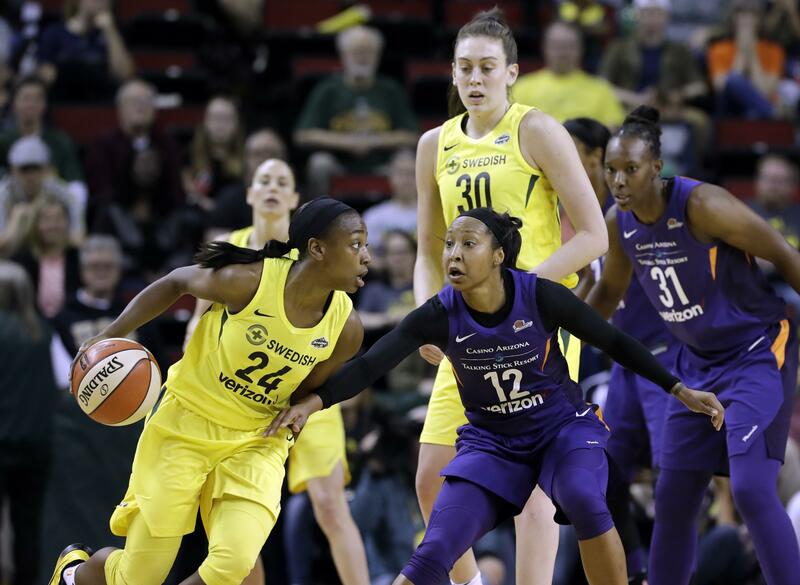 SEATTLE – Jewell Loyd scored 29 points and made four 3-pointers, Breanna Stewart added 28 points and the Seattle Storm overcame a 14-point deficit in the fourth quarter to beat the Chicago Sky 95-91 in overtime Friday night. Seattle trailed 80-66 with six minutes left in regulation but scored 13 of the next 15 points to pull to 82-79. Seattle was 2 for 18 from 3-point range until Loyd made 3s on back-to-back possessions to cut it to 86-85. Natasha Howard tipped in a miss for Seattle to tie it at 87 and blocked Diamond DeShields’ layup attempt with 4.1 seconds left. After a review, Seattle took possession but wasn’t able to get off a final shot. Stewart scored seven points in overtime, including Seattle’s only 3-pointer not from Loyd. The Storm were 5 of 24 from distance. Natasha Howard had 16 points and 10 rebounds for Seattle (2-1). Allie Quigley led Chicago (2-2) with 23 points, and DeShields added 19. Published: May 25, 2018, 9:31 p.m.